Installed ESXi 4 onto a USB key some time ago and it works well. Trying to install ESX 5.1 onto a USB key works fine during the installation, but it won’t boot for my white-box server. Found this posting http://vmtoday.com/2012/09/esxi-5-wont-boot-from-usb which sorted my issue. Boot server with install media (ESXi Installer) and press SHIFT+O to edit the boot options. In lower left corner of the screen insert a space after the word “runweasel” and type “formatwithmbr”. So it should read “runweasel formatwithmbr”. Press enter to continue the installation process. Once the install finishes it should boot from the USB key fine. Mininet creates a realistic virtual network, running real kernel, switch and application code, on a single machine (VM, cloud or native), in seconds, with a single command. Mininet is a network emulator. It runs a collection of end-hosts, switches, routers, and links on a single Linux kernel. It uses lightweight virtualization to make a single system look like a complete network, running the same kernel, system, and user code. A Mininet host behaves just like a real machine; you can ssh into it (if you start up sshd and bridge the network to your host) and run arbitrary programs. The programs you run can send packets through what seems like a real Ethernet interface, with a given link speed and delay. Packets get processed by what looks like a real Ethernet switch, router, or middlebox, with a given amount of queueing. When two programs, like an iperf client and server, communicate through Mininet, the measured performance should match that of two (slower) native machines. WinDirStat is a disk usage statistics viewer and clean-up tool for various versions of Microsoft Windows. The directory list, which resembles the tree view of the Windows Explorer but is sorted by file/subtree size. The treemap, which shows the whole contents of the directory tree straight away. 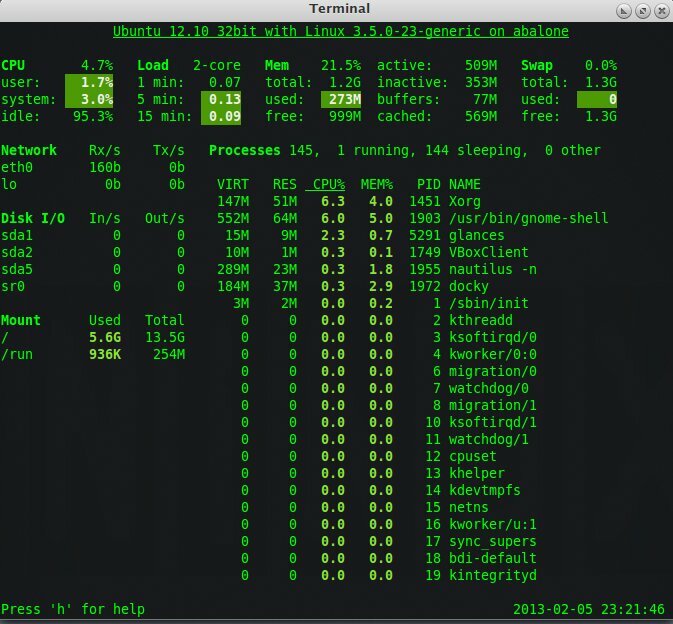 Glances is a CLI curses based monitoring tool for GNU/Linux and BSD OS. 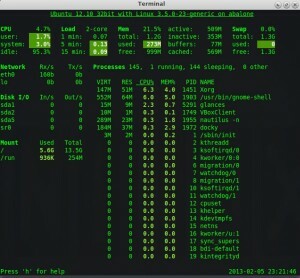 Glances uses the PsUtil library to get information from your system. As the name suggests it’s a very handy application to fire up and have a quick glance at the systems load including all components such as CPU, Memory, Network, Disk, Sensors and more. FF Multi Converter is a simple GUI application which provides one-stop solution for converting files. It can convert video, audio, image, and document by using some open source libraries. It uses FFMPEG for converting video and audio, PythonMagick for converting image, and unoconv for converting document. FF Multi Converter provides an easy way to convert all multimedia files in one place! Install the Ubuntu One Indicator to access and manage your Ubuntu One account with this indicator. It displays the current information of your Ubuntu One account.